It was disappointing that the Club’s Honorary Vice president, HH The Maharaja of Patiala was not able to attend and present his Bowl. Equally, the attraction of playing with a pink ball and in coloured clothes to be followed by a curry supper did not materialise. Nevertheless, all was looking good. The Club XI was brim full of batsmen in form and, more importantly, a bowling team capable of wresting the Patiala Bowl away from the College and, if that wasn’t enough, the entire team were on site and in Club ties and Blazers half an hour before the game was due to start. All were confident, none more so than the Match Manager and looking forward to the pink ball and 35 overs of mayhem. From here it could only change! 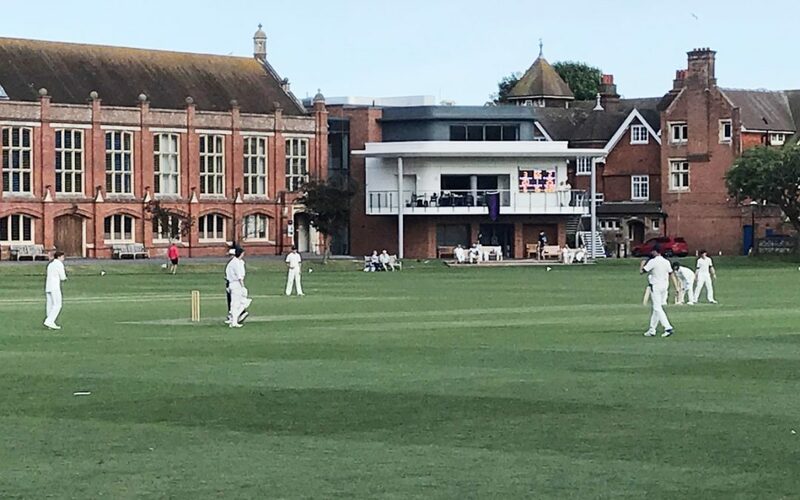 The College, won the toss, elected to bat and set off slowly thanks to some early pressure by Mark Banham, Debayan Dasgupta (candidate) and Charlie Phillips. Two wickets fell early with the College star, overseas international (ZIM) Tawanda Muyeye brilliantly stumped by Matt Suckling off Banham but that brought Fiontan Logan and Oli Streets, both Kent Academy players, together. Though Tom Calder and Tim Lerwill slowed the run rate the total moved steadily on with Streets (60) eventually holing out to off Dasgupta in his excellent second spell while Logan (107*) reached his century. Logan getting to his century before the heat got to him and provided an easy wicket for the MM and Streets holing out to Dasgupta in his excellent second spell but not before they had seen the College breach 200. Even so, 230 to win at just over 7-an-over was achievable on the good batting wicket and fast outfield. However, Joe Cavanagh (6) was caught behind early on and though Calder and Suckling looked serene, after 11 overs the Club had scored only 37 and a battle was on and in recognition of the requirement accelerated to post 78 by the 18th over when the wheels came off. Suckling (35) was bowled and the next over Calder (33) was caught on the boundary; The start of a slide that was to see the next 7 wickets fall for 14 runs – some outstanding catching but two Run Outs before the Tail fell to accurate fast bowling. It would be nice to believe that the two (one serious) injuries sustained in the field were unhelpful but I fear that in spite of a (paper) powerful confident selection were bested by the College who continued their winning ways this season. The President kindly presented the Patiala Bowl to Tawanda Muyeye and stressed that the Club will be back in 2019 to …… bring the Bowl home!